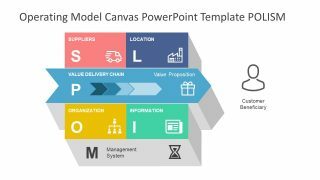 The Operating Model Canvas PowerPoint Template is an outstanding presentation of business strategies. 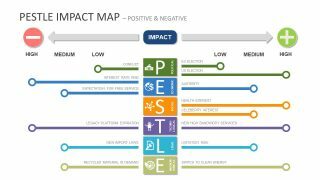 The Operating Model Canvas is a management tool to align activities with other processes and organizational strategies. The main attraction of methodology for companies is that it converts strategies and business model canvas into an operating model. The incredible PowerPoint of strategic management concepts has three slides. These are the three amazing layouts of flat design vector shapes and icons. 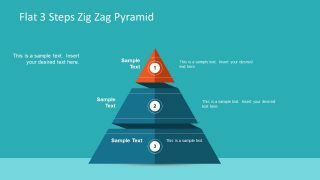 Therefore, the customization of PowerPoint shapes is easier by making changes in given options. For example, the users can add colors to the plain white background from design menu option to format background. Moreover, add gradients, patterns or picture to the background by selecting tool bar options which appears on the right side. 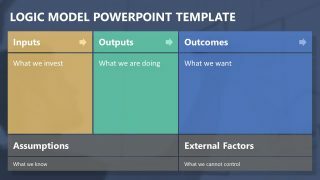 The Operating Model Canvas PowerPoint Template is a graphic illustration to demonstrate gap between strategy and execution. The model presentation template shows six segments of canvas model; also known as, POLISM. This stands for Processes, Organization, Locations, Information, Suppliers and Management system. These segments of operating model canvas enable companies to align operations and functions with strategies. 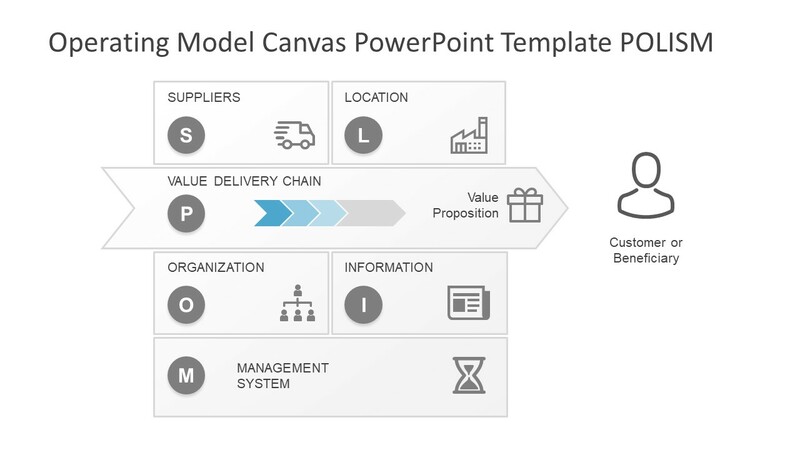 Following is the brief description of segments in the operating model canvas. 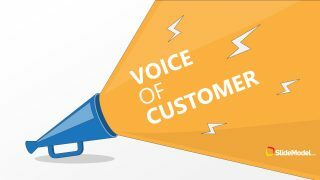 Processes: Work require to deliver value proposition. See more detail template for value proposition canvas here. Organization: The structure and functions require to help people make decisions. Location: Where work is done. Information: Documentation and relevant data for software application and to support the work. This is a one-page template design, like business model canvas. However, the slides have flat infographic design and template with sticky notes. Whereas, the last slide design is a 3D version of colorful segments. 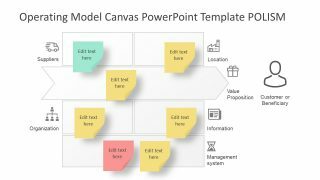 The SlideModel.com has more PowerPoint templates of Business Model Canvas and Marketing Model Canvas. Further, the operating model canvas is suitable for managers to demonstrate logical design of their processes.